DAILY FILM DOSE: A Daily Film Appreciation and Review Blog: A BLUE FONT EDDIE MURPHY POSTER! Victory! 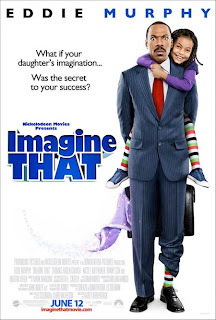 The trailer and poster for the new Eddie Murphy kids comedy IMAGINE THAT has been released by the Paramount publicity team. Someone's catching on. Cudos Paramount! I was driving the streets of Toronto yesterday, and drove past a bus with a giant banner advertising “Meet Dave” - a new family comedy with Eddie Murphy. As we all know Eddie Murphy’s late career work (save the “Dreamgirls" blip) has been either milking "Shrek" for Dreamworks, or starring in kid-friendly family pictures such as this. The “Meet Dave” banner, which is probably being plastered in every major city in Canada and the U.S., features the big mug of Mr. Murphy over top of the title in bold red font against a white background. Just change the title and the expression on Eddie's face and you have the poster for every other kid flick he’s made since “The Nutty Professor”. For some reason this annoys me to no end. Of course, the distributor who markets the film (in the case of "Meet Dave", 20th Century Fox) wants grab it’s audience by whatever means necessary and pull them into the theatre. One of their tactics is to have the poster or other promotional material quickly identify with or remind its audience of other successful films of the same genre. That's why the "National Treasure" posters vaguely resembles the "The Mummy" posters. But with these Eddie Murphy films, the lack of creativity is simply ridiculous. I am not the audience for “Meet Dave”, so why am I so bothered? Perhaps it’s the uncreativity of the marketing department, which charge large amounts of money against the production to create the worst example of template marketing. It’s also a shameful reminder of the dreck that Eddie Murphy is making his living on these days – but as evidenced by his work in “Dreamgirls” he can still act. I have no problem with these films which I’m sure bring much laughter to six-year olds but out of respect for Mr. Murphy and everyone else that isn't six, change your marketing campaign. At the very least, change the colour of the font. Please.